When someone says there's doughnuts in the break room. It's more than a little unlikely that a big-budget Hollywood franchise based on an old TV series could maintain a high level of quality over the course of six movies and 22 years, but somehow the Mission: Impossible series has accomplished just that. 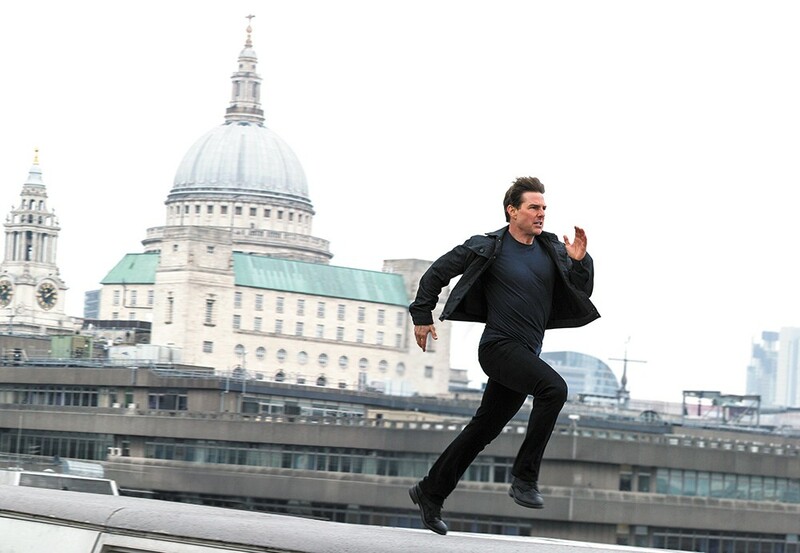 The latest installment, Mission: Impossible — Fallout, is the first from a returning director (Christopher McQuarrie, who also directed 2015's Mission: Impossible — Rogue Nation), which loses a bit of the excitement of seeing a different auteur take on each new film. But McQuarrie doesn't just repeat himself here, staging stunt sequences that are even more intense and awe inspiring, and putting together a plot that builds on past continuity, rather than mostly ignoring it. The real auteur of the Mission series, of course, is producer/star Tom Cruise, who is the driving force behind many of the movies' most outrageous stunts (which he insists on performing himself), and brings just the right mix of steely intensity, roguish charm and, increasingly, haunted regret to his portrayal of superhuman secret agent Ethan Hunt. In his position as the top (and sometimes seemingly only) member of the Impossible Missions Force, Hunt takes on the tasks that no one else will, and he's gotten almost nothing but grief for his trouble. As one character points out in Fallout, he's been disavowed and abandoned by his own government so many times that it's easy to believe he would snap and become a terrorist menace out for vengeance. He doesn't do that, of course, because Ethan Hunt is the most principled and compassionate man on the planet, which turns out to be the main theme of Fallout. This time around, Ethan and his loyal team (Ving Rhames' Luther Stickell and Simon Pegg's Benji Dunn) are on the trail of a trio of stolen nuclear warheads, with the fate of the world at stake, as usual. As is now customary for these movies, the plot becomes hopelessly convoluted (at one point one character literally yells at another character about how complicated their plan has become), involving returning figures including sadistic terrorist Solomon Lane (Sean Harris), shadowy MI6 agent Ilsa Faust (Rebecca Ferguson) and newly minted IMF secretary Alan Hunley (Alec Baldwin). There's also cocky CIA operative August Walker (Henry Cavill), who's been sent by the new CIA director (Angela Bassett) to keep an eye on Hunt and his team. With his square-jawed good looks, Cavill (who's still best known for playing Superman) sometimes comes off like Tom Cruise 2.0, and that parallel works well when the movie pits Hunt against Walker, who makes for a more worthy adversary than the somewhat underwhelming Lane. Whether Walker is actually an adversary is kept unclear for quite some time, and Fallout is so full of double-crosses and sudden reversals that it can get a bit exhausting. But McQuarrie, who also wrote the script, knows how to build suspense, and even if the audience might need a diagram to keep up with the plot, that diagram would at least look really elegant. McQuarrie makes sure that Fallout isn't just about saving the world from nuclear annihilation; it's also about the relationships that Hunt has cultivated over the last two decades. Seeing Cruise literally risk his life jumping out of a plane from an absurdly high altitude or hanging from the side of a cliff (both of which he does here) is often breathtaking, and McQuarrie and Cruise know how to make the most of those big-ticket moments. The original print version of this article was headlined "Mission: Accomplished"
Mission: Impossible -- Fallout and Mission: Impossible -- Fallout 3D are not showing in any theaters in the area.